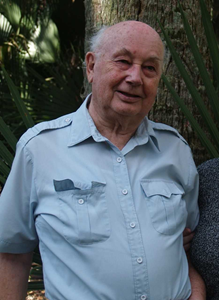 Uwe A. Pommerening, age 90, passed away peacefully on August 26th 2018. Uwe was born on March 11th,1929 in Heide/Holstein Germany to Paul and Luise Pommerening. He is survived by his loving wife of 60 years, Irmgard Pommerening; Son Mark Pommerening and Granddaughter Marika Pommerening. Uwe was a kind, gentle, giving person with a love to travel. At 30 years old he immigrated to New York and Irmgard soon followed. They married and had two children, Alice and Mark. Uwe was a telecommunications engineer for Stromberg Carlson. His gentle spirit would made him friends wherever he would go. And these friendships would last a lifetime. Add your memories to the guest book of Uwe Pommerening. Our family - the Sparmann's - knew the Pommerenings when they were living in Webster, NY. There Uwe was also working for Stromberg Carlson until he was transferred to Orlando, Florida. Uwe generated a number of patents for the company. When asked how long did it take them to get used to Florida, they said, one week! We surely missed them when they left, but they made new friends in Florida in their lovely home with a pool!